“You’ve Got Mail” was based in a kinder, gentler, perhaps even quaint time of physical bookstores and dialup computers. In today’s world of high-speed internet with competing news services dishing up the latest trash 24 hours a day, 7 days a week, 365 AND A QUARTER! days a year we need a different philosophy. I just happen to have a suggestion. 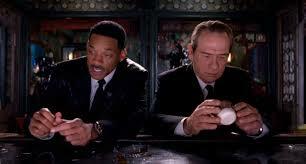 When CNN flings the latest on Justin Bieber at you; when Fox digs up Sarah Palin; even when ABC releases the Kardashians, take your advice from the Men in Black. K: We do not discharge our weapons in view of the public! K: There’s always an Arquillian Battle Cruiser, or a Corillian Death Ray, or an intergalactic plague that is about to wipe out all life on this miserable little planet, and the only way these people can get on with their happy lives is that they DO NOT KNOW ABOUT IT! This entry was posted in Actor, Arts, Communications, Culture, Education, Humor, Leadership, Media, People, Philosophy, Technology, Television and tagged Men in Black, MIB, Tommy Lee Jones, Will Smith. Bookmark the permalink.